There's masses of interesting stuff about John's Islington connection in a blog called Islington Faces. Who knew that our man was once in a production of The Pajama Game directed by Simon Callow? John's programme about his relationship with the French Baroque composer Jean-Philippe Rameau Who Does John Hegley Think He Is? can also be found here or via the app. It will be available until midnight on 31 December January 2098 so be sure to put that date in your diary to be certain you don't miss it. And the latest addition to John's list of favourite picks is the Hat in the Cat Hat Shop in Perth. See links in John's Picks below. 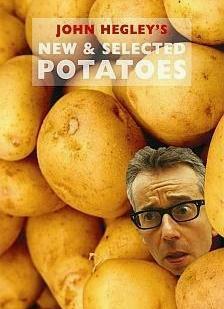 A DOUBLE HELPING OF SPUDS!!!!! 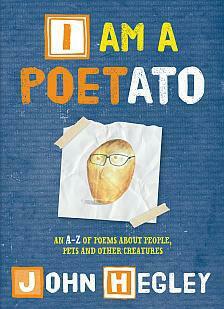 John's new books NEW & SELECTED POTATOES and I AM A POETATO are now on sale. Available in all the usual places! You can now keep track of John on Facebook - just click on the button. And if you have a Facebook account please click the Like button below, it will help spread the word! Note that this is a Community Facebook page and John isn't personally involved in it. Please don't use it to send him personal messages, use the email address on the Contact John page instead. Go to the Links page to check out a pot pourri of things that have caught John's fancy. These include Julian Goodacre Bagpipe Maker, Clod Magazine, Luton Haiku, Paul Hegley, Partan Press Children's Books, the Jelly Rollers Dragon (love child of Keith Moore of the Popticians) and the Hat in the Cat hat shop. The winning entries can be viewed by clicking here. There's Trains. There's John Keats. There is Joan of Arc. There are trucks and boats and ship. With chips. What's so funny about peace, love and understanding? With drawings largely by the author. Find out more about the book. Seventeen adventures and one short drama, each presented in French and English. Available from Donut Press for the amazing bargain price of £5 with free delivery! An absolute must for aficionados of the Hegley oeuvre! John's book Uncut Confetti has a strong autobiographical strand and a running thread of animal-related poems. There is the usual abundance of splendid drawings accompanied by a photograph or two.